Earlier this week, in our Football Relativity post, we analyzed who Aaron Rodgers is compared to other quarterbacks. (See the Packers entry for those thoughts.) We thought that was an interesting exercise, and so it’s no surprise that since then we’ve set our minds to try to figure out another of the NFL’s final four quarterbacks, Mark Sanchez. And we’ve decided: Mark Sanchez is at least Trent Dilfer. And Mark Sanchez might be Ben Roethlisberger. Sanchez is not yet a consistent quarterback. He has sterling playoff success in his first two pro seasons, notching four road playoff wins thus far. And in these playoff games, Sanchez has rarely carried the Jets. But he has made big plays. Last year against the Bengals, for example, Sanchez hit a big throw to Dustin Keller that ended up being a key play in the game. This year, even in his inconsistent game against the Colts, Sanchez found Braylon Edwards on a key play to turn Nick Folk’s game-winning field goal attempt from a long kick to a far easier attempt. In these ways, Sanchez is like Dilfer, who quarterbacked the Ravens to their Super Bowl run a decade ago. Dilfer was not a dominant force for those Ravens teams, but he avoided crucial mistakes, and he seemed to hit one big throw a game to set up a touchdown. Throws to Shannon Sharpe against the Raiders and to Brandon Stokley against the Giants still come to mind. 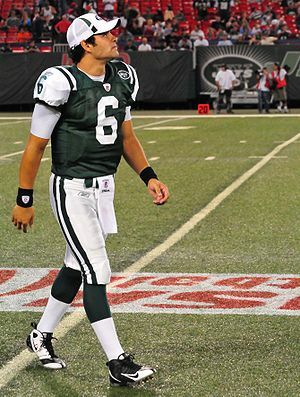 Sanchez can do this for the Jets right now. But there is a key difference between Sanchez and Dilfer in this – that was the peak of Dilfer’s career, while Sanchez is still growing. He can get better. And in that way Sanchez is like his AFC championship game counterpart, Ben Roethlisberger. Roethlisberger has won two Super Bowls thus far, but it’s hard to remember at this point in his career that in the first win, five years ago, Roethlisberger was the Steelers’ weak link. His Super Bowl 40 performance against the Seahawks was far from spectacular, but it was good enough to let the Steelers’ talent win out. And from that point, Big Ben kept developing, and three years later his performance against the Cardinals was so terrific that he outdueled Kurt Warner in a shootout, complete with a game-winning TD throw to Santonio Holmes at the end of the game. Big Ben was a different quarterback in his second title than he was in his first. And that’s the hope for Sanchez and the Jets Since Dilfer and Brad Johnson (Buccaneers) won Super Bowls in back-to-back years, the list of Super Bowl winning quarterbacks looks like a who’s who. Tom Brady has won three, Roethlisberger two, Peyton Manning one, Drew Brees one, and Eli Manning one. We’ve always like Sanchez – we favored him over Matthew Stafford in the draft two years ago – but the truth is that if Sanchez is to join that list of Super Bowl winners, it will have to be a la Dilfer. But if Sanchez is really growing like Roethlisberger did, as we suspect he might be, then Jets fans have a lot to be excited about – both this weekend and in the future. Which fantasy football performances from the Sunday Week 2 action should you take seriously, and which can you chalk up as one-week frauds? Let’s take an in-depth look. With each applaud or a fraud designation, we explain what action you should take. Of the skill positions that fantasy football owners care about, none has developed depth more quickly than tight end has in recent years. So as we continue to build our draft board, it’s time to compare the value of the draftable tight ends. We’ll compare these tight ends on a 10-point scale, with 10 denoting the most valuable tight ends and 1 denoting tight ends who are barely draftable. We’ll indicate throughout the comparison what the levels mean. Remember that for far more fantasy football coverage, you can check out our fantasy football category. 10 – Dallas Clark, Colts – Clark is an elite receiver who just happens to play tight end. Last year, he finally played all 16 games and put together a do-everything fantasy season with 100 catches for 1,106 yards (both career highs) and 10 touchdowns. That’s probably the limit of what Clark can do, but the good news for fantasy owners is that even 80 percent of that production makes Clark a no-brainer starter at tight end and a legitimate starter at receiver for leagues that don’t have to start a tight end. He’s the lone tight end to make it onto Tier 2 of our overall draft board. 10 (con’t) – Antonio Gates, Chargers – Gates had a rebound season last year, setting a career-high with 1,157 receiving yards while making 79 catches, the most he had had since 2005. Gates also scored eight touchdowns, marking the sixth straight year he’s had at least that many. That dependable production is what has made Gates a fantasy stalwart, and the good news on Gates’ stock this year is that Vincent Jackson’s suspension and potential holdout may actually lead to a few more targets for Gates this year. Count on Gates for eight touchdowns as always, but more importantly, count on him for 1,000 yards once again. *Clark and Gates are the only tight ends on Tier 2. That means they are worth starting as one of two receivers in 10-team leagues that do not require a starting tight end. 9 – Vernon Davis, 49ers – Davis, a former No. 6 overall draft pick, finally lived up to his potential last year, putting up 78 catches for 965 yards and a whopping 13 touchdowns. All of those numbers were career highs by a wide margin, but we don’t need to worry about them being a fluke because his increased production was more of a sign of the light coming on. Davis is a safe bet as an elite tight end, and the only number you can’t expect him to replicate is 13 touchdowns. Trust Davis to get you 8-10 scores, and you’ll still be thrilled with him as a draft pick at the top of Tier 3. 8 – Tony Gonzalez, Falcons – T-Gon’s first year in Atlanta was a good one, as he put up 83 catches for 867 yards and six touchdowns. The scary thing is that his yardage total was actually his lowest since 2002, which speaks volumes about Gonzalez’s consistency. He’s had at least 63 catches and 773 receiving yards for 11 straight seasons. And this year, if Matt Ryan stays healthy, Gonzalez could see a slight uptick in his numbers. For now, figure on an 80-catch, 800-yard season with six touchdowns, knowing that Gonzalez is capable of numbers that are even a little better. He’s safely on Tier 3 as a top tight end option. 8 (con’t) – Jason Witten, Cowboys – The good news about Witten is that he’s surpassed 90 catches and 1,000 yards in two of the last three seasons, making him an elite yardage producer at tight end. But the bad news is that he’s had more than six touchdowns just once in his seven-year career, and last year he had just two. Because he’s not a consistent red-zone option, we can’t include Witten on the Dallas Clark/Antonio Gates level, and Vernon Davis has the upside to surpass Witten’s numbers as well. But Witten is truly an elite tight end, and if you’re using early picks elsewhere, Witten is a great option as a terrific starter at the position. *Davis, Gonzalez, and Witten fit on Tier 3 of the draft board, which means their value as receivers is equivalent to the top 25-30 at the position. They are legitimate starters in three-WR leagues without a tight end position. 7 – Brent Celek, Eagles – Last year, Celek put up fantasy numbers that rivaled everyone at the position except Vernon Davis, Dallas Clark, and Antonio Gates. His 76-catch, 971-yard, eight-touchdown season made him a game-changing tight end for fantasy owners. But this year, with Kevin Kolb replacing Donovan McNabb at quarterback, we expect Celek’s numbers to sink just a bit, as we discussed in this post. Celek will still surpass 60 catches or 800 yards, but the inevitable inconsistency of a first-year starting quarterback depresses Celek’s start just a little. He sneaks onto Tier 3 of our draft board, but only barely. 7 (con’t) – Owen Daniels, Texans – Daniels was on his way to a phenomenal season last year before a knee injury shelved him in Week 8. He was on pace for an 80-catch, 1,038-yard, 10-touchdown season, which would have put him on par with Dallas Clark and Antonio Gates. We won’t move him that far up, especially since his midseason knee injury could hamper him a bit, especially early in the season. But expecting 60-70 catches from Daniels with 800 yards is reasonable, and there’s upside for even more production. 6- JerMichael Finley, Packers – Finley’s second season was a breakout one, as he put up 55 catches for 676 yards and five touchdowns despite missing three midseason games. Finley’s athleticism is stunning, and he and Aaron Rodgers have a great rapport. But Rodgers has perhaps the league’s deepest core of receivers, and that means that Finley’s opportunities are just a bit limited. Finley’s 16-game pace for ’09 – 68 catches for 832 yards and six scores – is a reasonable expectation for his 2010 numbers. That makes him a solid starter. 6 (con’t) – Chris Cooley, Redskins – In an earlier post, we discussed how Cooley has a chance to grow his numbers now that Donovan McNabb is in D.C. So where does that leave Cooley in the tight end pecking order? We see him getting into the 70s with his catch numbers and nearing 800 yards as well. The question is whether Cooley can get back to his solid scoring ways after scoring just three total touchdown in the last two years. We’ll hedge a little bit on that and put Cooley on Tier 4 instead of back among the super-elite at the position. 6 (con’t) – Zach Miller, Raiders – Miller had a sneaky good season last year, and we’ve already proclaimed that the addition of Jason Campbell should make the Raider tight end even better this year. If that happens, Miller will be a 70-plus catch guy who nears 900 yards. He’s a quality starting tight end whom you can depend on as a Tier 4 draft pick. Note that there’s also a tight end named Zach Miller playing in Jacksonville and be careful to click the right one in your draft. *Celek, Daniels, Finley, Cooley, and Miller are solid starting tight ends in 10-team leagues. They fit on Tier 4 of the draft board. 5 – Visanthe Shiancoe, Vikings – Shiancoe scored a career-high 11 touchdowns last year, and that buoyed his fantasy stock. But that TD percentage is abnormally high for 56 catches and 566 yards, and that causes us to keep Shiancoe’s stock a little lower than it was last year. The uncertainty about Brett Favre’s future, at least right now, is another reason not to bet too heavily on Shiancoe. He’s a borderline fantasy starter at tight end, not a sure-fire starter. 5 (con’t) – John Carlson, Seahawks – Carlson was one of the few bright spots in a terrible Seahawks season, piling up 51 catches for 574 yards and seven touchdowns. Those numbers mirrored his rookie-year stats from ’08 and give a good indication of Carlson’s ability. Maybe he gets more chances with Pete Carroll in town this year, or maybe he does about the same. Regardless, he’s a borderline fantasy starter but not a huge upside candidate. 4 – Heath Miller, Steelers – Miller had a terrific season last year with 76 catches for 789 yards, both career highs, and six touchdowns. But it would be unreasonable to expect Miller to repeat those numbers this year because of the Steelers’ QB situation over the first four games of the season. Our expectation is that the Steelers will struggle to throw the ball with Byron Leftwich or Dennis Dixon, and Miller’s numbers will suffer as a result. Miller is a starting-quality tight end once Ben Roethlisberger returns, but he falls just below that level because of Big Ben’s suspension. 4 (con’t) – Kellen Winslow, Buccaneers – Winslow had a shockingly good year in ’09 with 77 catches for 884 yards and five touchdowns despite a rotating smorgasboard of inexperienced and/or inefficient quarterbacks. Part of the reason for that was that Winslow was by far the best receiving option of any kind Tampa had. This year, we expect those numbers to slip a little because the Bucs want to develop young receivers Arrelious Benn, Mike Williams, and Sammie Stroughter. Josh Freeman’s development, however, could keep Winslow’s numbers from plummeting, as we discussed earlier. Winslow has value as a bye-week fill-in at tight end, and if you wanted to start him in a larger league, we wouldn’t argue, but our hunch is that Winslow’s numbers slip a bit in 2010. *Shiancoe, Carlson, Miller, and Winslow are potential starters in larger leagues or premium fill-ins in smaller leagues. They fit on the bottom of Tier 4 of the draft board. 3 – Dustin Keller, Jets – Keller gets a ton of pub, in part because he scored touchdowns in all three of his playoff games last year. But his season stats of 45 catches, 522 yards, and two touchdowns were more of bye-week fill-in than starter stature. Maybe Keller develops a little bit this year with Mark Sanchez, but remember that the Jets have also added Santonio Holmes, Laveranues Coles, and a full season of Braylon Edwards to their receiving corps. Our hunch is that Keller stays under the 60-catch level and off the top of the tight end list. 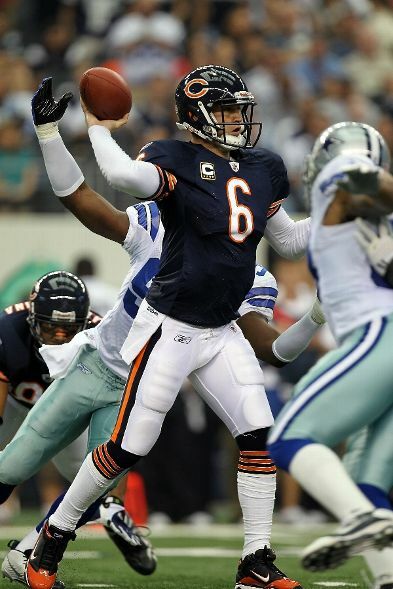 3 (con’t) – Greg Olsen, Bears – As we discussed in this post, offensive coordinator Mike Martz’s arrival in Chicago is not good news for Olsen. Moreover, Olsen’s eight touchdowns last year was a high percentage given his 60 catches, and so it’s reasonable to expect that number to slip as well. Olsen is a bye-week fill-in who has enough upside to merit a draft pick in larger leagues, but don’t expect too much or else you’ll be disappointed. 2 – Jeremy Shockey, Saints – Shockey had a decent season with New Orleans, piling up 48 catches for 569 yards and three touchdowns despite missing three games. That pace would make him a borderline starter in larger fantasy leagues. However, Shockey hasn’t stayed completely healthy through most of his career, missing at least two games in each of the last three years. That’s enough reason to slot him lower on the draft board than other tight ends whose fantasy numbers are on the same pace. 1 – Kevin Boss, Giants – Some expected Boss to break out as a fantasy tight end last year, but he took a minor step forward instead of a major one. His numbers – 42 catches for 567 yards and five touchdowns – were OK, but they didn’t keep up with the other youngsters who have made tight end an incredibly deep position. It’s fair to expect Boss to match his ’09 numbers, but we don’t foresee another step forward, even a minor one. It’s clear in fantasy football this year who the top eight quarterbacks are. But who are the sleeper quarterbacks in this year’s crop? In a previous post, we identified the top quarterbacks, and we’ve also discussed Donovan McNabb’s declining stock and Jason Campbell’s promise in this post. Now we’re going to comb through the rest of the NFL’s starters to see which have the upside to contribute as fantasy starters this season. Our baseline in this post is to find guys who are better than Big Ben. Roethlisberger would belong with the top 8 quarterbacks if not for his suspension, and so this post seeks to find guys we’d rather have than Roethlisberger starting in Week 5. We’ll use our applaud or a fraud tool to do this, identifying with each verdict what it means in relation to Big Ben plus a fill-in. As we approach the NFL draft later this month, we wanted to go on record about a couple of players we really like in this year’s class. This is always a risky business, but these are guys that we think are going to be terrific pros even if talent evaluators are finding some warts in their profiles. Yesterday we picked Texas’ Sergio Kindle as our defensive crush; now we turn to the offensive side of the ball. By the way, for all our draft coverage, including posts on Kindle, Jimmy Clausen, and Tim Tebow, go to the Draft category on the blog and click around. When you think of impact players in this year’s NFL draft, most minds go to QB Sam Bradford, RB C.J. Spiller, and WR Dez Bryant. All those players have their assets, but fans shouldn’t forget the player who might make the quickest impact for teams is a guy who played but one game in his senior year – TE Jermaine Gresham. Few players are as physically imposing as Gresham, who’s 6-foot-5 and 260 pounds yet still runs in the 4.8 range for his 40-yard-dash. And Gresham isn’t just a physical specimen – he’s also productive, as he piled up 25 touchdowns in ’07 and ’08 before missing the 2009 season with a knee injury. The only question teams can ask about Gresham is about the health of his knee. Otherwise, they know what they’ll get from him. Sure, he’s not ever going to be a dominant blocker, but he can stretch the field as a receiver in a way that makes a huge impact. Think about what Dustin Keller has done for the Jets or what JerMichael Finley has done for the Packers, and then realize that Gresham has more physical ability than either guy. That will help you start to get a feel for how much of an impact Gresham can make. Not since Vernon Davis has there been a tight end this gifted come out in the draft, and Gresham won’t cost a top-6 pick like Davis did. Gresham may be pulled off the board in the teens, and he’s solid value there, but once the draft enters the 20s Gresham would become a godsend for whatever team decides to pick him. Knee injury or not, Gresham is going to be a huge catch for a team that needs a tight end who can catch.